The Signal OG Series Flat Camber Profile has a stable all mountain feel to it that is very typical of flat boards. There was nothing that blew our minds but nothing that was bad either so for the right rider this could be pretty fun. We have ridden a lot of flat boards in our day and we find this type of profile does well in a few areas but it’s hard to make an all rounder. On Snow Feel: It’s easy on and off the chair for one footing. It’s stable between the feet and isn’t bad for those that like to cruise the mountain and stop in the park on occasion. Powder: No powder here but all our experiences with flat camber lead us to beleive that It’s better than camber but it’s more work than most boards with some rocker in them. There will be some work on your back leg. 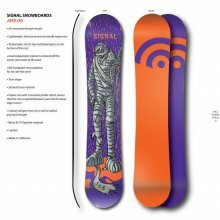 There is a 1 cm set back that helps a little for directional powder riding but it’s still more of an all mountain freestyle type of ride. Turn Initiation and Carving– We found the flat camber to be a little twitchy and not the most fun to make turns on the mountain. It’s not bad for quick edge to edge turns. Same old problem when it comes to carving. It just doesn’t turn right when laying into a carve but it’s ok for medium to wider radius turns. Speed: Not bad at moderate to sort of fast speeds. It’s stable and predictable. Uneven Snow- It felt a little on the unforgiving side here and just didn’t feel easy in the rough patches we experienced. Approximate Weight– Not terribly heavy or too light. Kind of on the sturdy side of light. 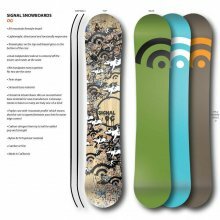 Switch: This is a board with a twin flex and twin shape but the 1cm set back takes it just a bit shy of being excellent. Jibbing- It’s a little stiff for our taste but as the board breaks in and gets softer the flat profile might be better here. Pipe: No pipe play on this day but it felt like it could be good here because of the solid edge hold but I don’t think it would drive from wall to wall too well due to the flat profile. Jumps: Pretty snappy when it comes to generating your own air and not a bad ollie board. The jump lines aren’t bad either. It provides a nice stable take off. It’s missing the natural spring that you get from boards with some bend in it that we mainly prefer but it’s not bad. Very stable on the approach to a kicker too. We try to get as many images of the Signal OG Flat, but forgive us if they're not all there.